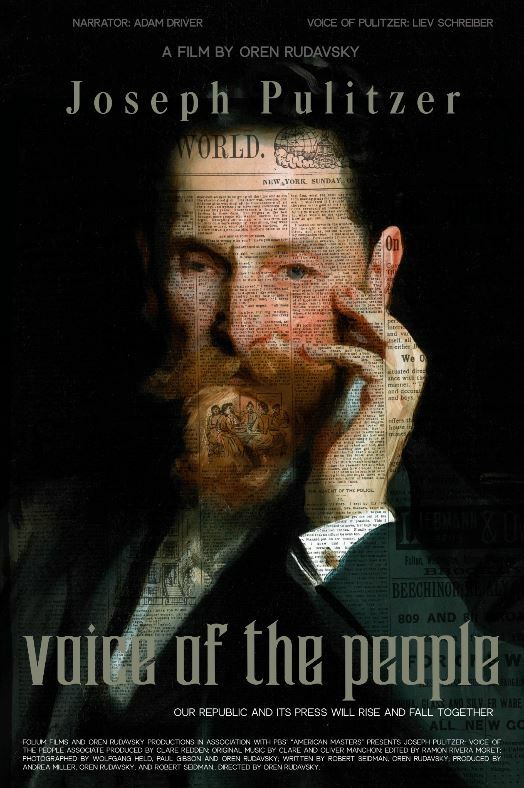 Oren Rudavsky's JOSEPH PULITZER: VOICE OF THE PEOPLE Opens March 1 in NYC & March 8 in LA! A film by Oren Rudavsky in association with PBS American Masters. In this landmark film by acclaimed director Oren Rudavsky (Colliding Dreams, Hiding and Seeking, A Life Apart), Adam Driver is the narrator and Liev Schreiber is the voice of Joseph Pulitzer. Together, they bring to life the virtually unknown man whose name is attached to the Pulitzer Prizes for excellence in journalism. Joseph Pulitzer: Voice of the People mixes striking contemporary scenes and luminous archival images, as well as recreations and interviews filmed by cinematographer Wolfgang Held. Pulitzer's remarkable transformation of newspaper graphics is made visually thrilling by Andrew Roberts (Obit). The original score by Olivier and Clare Manchon references the classical and popular music of the Gilded Age. The film features indelible interviews with novelist Nicholson Baker, historians David Nasaw, Chris Daly, Andie Tucher, James Morris McGrath, Nancy Tomes, Hasia Diner, Daniel Czitrom and Elizabeth Gitter. Pulitzer's story - that of an immigrant from Hungary, and a Civil War recruit, followed by his transformation first in St. Louis and then in New York into one of America's pre-eminent newspaper publishers, was tarnished by claims of "yellow journalism" during the Spanish American War. His struggle to maintain his reputation and day to day control of his empire even after he had gone blind - is both tragic and inspiring. Joseph Pulitzer’s New York newspaper, The World, would transform American media and make him wealthy, admired and feared. Throughout his four decades as a reporter and publisher, he created a powerful artistic vehicle that spoke specifically to waves of new immigrants. Towards the end of his life, isolated on his yacht, Pulitzer’s commitment to fearless reporting would be tested by the most powerful person in American life. On December 15th, 1908, President Teddy Roosevelt delivered a scathing indictment of Pulitzer to Congress - accusing the publisher of libel - for claiming that the Panama Canal - amounted to a colonialist overreach built on a $40 million cover-up. Roosevelt threatened Pulitzer with imprisonment. The president proclaimed: “it is high national duty to bring to justice this vilifier of the American people.” The parallel’s to today’s times are uncanny - sobering and disturbing. Pulitzer is an American icon who spoke of “fake news” and of providing opportunities to immigrants over one hundred years ago. While he is remembered for the prizes that bear his name, his own heroic battles in the face of grave illness and Presidential ire have been forgotten, as has the artistry and game changing originality he brought to newspapers. How did Joseph Pulitzer, once a penniless young Jewish immigrant from Hungary, come to challenge a popular president and fight for freedom of the press as essential to our democracy? Oren Rudavsky is the recipient of a Guggenheim Fellowship. Rudavsky produced the NEH funded PBS American Masters documentary: Joseph Pulitzer: Voice of the People, as well Witness Theater this past year. His films Colliding Dreams co-directed with Joseph Dorman (broadcast on PBS), and The Ruins of Lifta co-directed with Menachem Daum, were released theatrically. His film A Life Apart: Hasidism in America also co-directed with Daum was broadcast on PBS and his film Hiding and Seeking was nominated for an Independent Spirit award and was broadcast on the PBS series POV. His film And Baby Makes Two was co-directed with Judy Katz and was an ITVS funded film broadcast on PBS Independent Lens. He co-wrote and directed the fiction feature The Treatment which won first prize, Made in New York at the Tribeca Film Festival. Rudavsky’s other work includes writing and producing segments for the ABC national series PrimeTime Live, the PBS series Media Matters, Religion and Ethics Newsweekly, the Bloomberg series Risktakers, and stints on Saturday Night Live and The Real World Season One. Other work includes Dreams So Real, Gloria: A Case of Alleged Police Brutality, Spark Among the Ashes and A Film About My Home. Please visit the film website for more information, photos, press kit and more.